Ahhhh...What is better than a plate of pad thai? A plate full of gooey rice noodles, rich scrambled egg, crunchy roasted peanuts, and fresh bean sprouts all seasoned with the sweet, salty, spicy, and sour flavors that are typical in Thai cooking. This is my perfect noodle dish. In Thailand pad thai is fast food, cheap food, and good food. The endless street vendors whip this dish up in minutes and serve it piping hot to drooling locals and tourists. I took a cooking course at Asia Scenic in Chiang Mai, learned to make eight local Thai dishes, and chose to make pad thai as my third course, my noodle dish. I have made pad thai at home but my dish always fell far short of authentic. After cooking this dish in Thailand I understand my mistake - I have been over complicating the flavors and the technique, adding way too many and overworking all my ingredients. After cooking class I learned that less is definitely more when making this dish. This dish is aroi (delicious) so read below and learn how to make authentic pad thai in less than 15 minutes! Mix the above ingredients in a small bowl and serve this classic spicy and salty Thai condiment with rice dishes, stir fires, curries, and vegetables. To start soak the rice noodles in lukewarm tap water for 10-15 minutes. You want the noodles to be firm yet pliable. Heat a wok or large skillet on medium high heat add the vegetable oil until hot. Add the garlic, tofu and your selected protein of choice. Cook for about one minute. 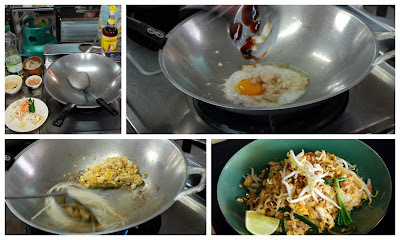 Crack the eggs into the wok, add the sugar, fish sauce, oyster sauce and mix together on high heat. Add the noodles and gradually add water (1/4 cup at a time) until the noodles are soft and tender. Remove from heat and plate. Garnish with chopped peanuts, bean sprouts, scallion, lime and prik nam pla. Amazing! I want to make this asap. Stan, I know - so simple! Let me know how it turns out. Happy New Year! It tasted really delicious, thank you very much for sharing.